I think Yal Ku Lagoon is a great place to visit for many reasons and it’s a perfect half day adventure. On days when the surf is a bit rough this little bay provides calmer waters. I’ve only been twice and would go again. The last time we went it was somewhat stormy and cool elsewhere. This is a wonderful place for beginning snorkelers for this reason. The entry is easy as you sit on a stairway or platform to put on your fins before dropping into the water. There are lots and lots of fish!I love the cave formations and valleys and felt comfortable swimming in between them and how it felt adventurous. You will notice an oily look to the water – this is caused from the freshwater meeting the saltwater and it does diminish visibility. The park setting is nice with lovely statues (which I think are done by Fransico Zuniga) and there’s a snack bar & refreshment stand there, but I’d recommended bringing your own lunch and refreshments as it’s a bit pricey for what it is. There are nice shady spots for a tailgate picnic or have an inexpensive lunch at Lucy’s Kitchen before leaving Akumal. Admission is about $7 per person. Go early to beat the tour buses. I think you can return later in the day after a siesta if you want with your bracelet. Yal Ku Lagoon has bathrooms, change-rooms, lockers and they rent snorkel equipment. There’s also a snack bar. They also stock life-jackets if you require any. How to get there – Go through the archway at Akumal and follow the road all the way past the condos and eventually you’ll come to Yal Ku near the end of the road. It is about 3 miles. Today was our last full day at our home in Akumal so we decided stay at the condo, relax in the sun and do some snorkeling in the bay. Jill and I found our way out to the Gorgon Forest in Half Moon Bay – it was beautiful. This was probably one of the calmest days in the water so we were able to see a lot of sealife. Still no turtles, but at least we got to see them from the shore feeding in the seagrass area in the mornings and evenings. It was after all the end of the turtle season. I also decided on this last day to download all of my photos onto my laptop and give my new Olympus 770SW the plunge. It is waterproof rated to 33 ft. deep and it worked! Pshew! Better safe than sorry as in previous experiences. We also prepared for the trip home reluctantly. Mark had to go into town to get the tire repair before turning in the car the next day and while he waited he found one of the great massages that we’d read about for a mere $33 for an hour! He said it was definitely one of the best he’d had. Lucky guy! We were so busy having fun this whole time we forgot about our massages we wanted. Again, another item for the next trip’s itinerary. By the end of the day we were ready for a great meal and decided to spend our last evening at La Cueva del Pescador in Akumal. This restaurant was on our list of places to go, so this was our last chance. The service and food was outstanding! We ordered lobster, grouper, dorado and a couple of pitchers of margaritas and it was all so delectable! The band was not your typical touristy mariachi band, they were talented classical musicians with sweet music for our ears and our hearts. We were feeling quite happy and loopy when we left and also a little melancholy that our time here in Akumal had come to an end. Talk about saving the best for last. We wake with a little heaviness in our heads and our hearts. Our last beautiful sunrise……and we’re packing it in. It’s going home day……boo hoo! But, all good things must come to an end. We will forever be touched by our experiences here in the Roo. We loved it the first time, we love it even more now. We’ll definitely leave a piece of our hearts behind to be tended again and again. We missed Steve being here with us…….as he was always on our minds and will forever be in our hearts. May the wind and waves of the sea wash away the pain and may their footprints in the sand lead Jill and Sara towards new horizons at each new dawn. Love lives on! To Coba and Punta Laguna we go today! The ruins at Coba are situated in the jungle about 30 miles west of Tulum. You pass through quite a few Mayan villages and many tourist shopping spots for beautiful hammocks, blankets, ceramics and the like. We’d gotten a late start again and wanted to get to Coba as soon as possible, so onward we go. The road from Tulum to Coba is as straight as an arrow and they’re doing some improvments so it really is an easy drive.There’s actually a roundabout when you get to the turnoff to Coba. Funny, we are seeing more of these at home but it was the first I’d seen anywhere in Mexico I’d been. The ruins here are not as popluar as at Chichen Itza but are every bit as important archaeologically. Built in between two lakes there were over 50,000 Maya who lived in this great city between 400 AD and 1100 AD. The main pyramid Nohoch Mul is the tallest structure in the Yucatan. We didn’t get to see all of the ruins, but we plan on going back in the not too distant future……and next time we won’t be walking but renting the bikes instead. If you wish you can hire a driver, a Mayan man – a human powered tricycle with cart that you can ride in. Climbing to the top of the main pyramid was exhilirating if not just a little scary. This is definitely not recommened for anyone afraid of heights. Jill started up with us but headed back down. There is a rope that you can use to steady yourself and could save you if you needed it to. It was so hot and you are quite sweaty by the time you read the top, that we were pleased to go inside of the ruins and enjoy the strangeness and coolness of the air flowing through some holes in the walls. What an incredible view from on top of this pryamid! Looking out over a dense jungle and a large lagoon in the foreground made you feel as though you were on top of the world. After we left the ruins we ate at a rustic, little restaurant called El Bocadito. The food was cheap and was just fair, but at least the beer was cold. (I wouldn’t recommend this restaurant unless someone knows that perhaps it’s improved since 07.) The best part of eating here was watching a Mayan man across the street mowing the lawn with a machete. His determination and talented use of the tool he used did the job. 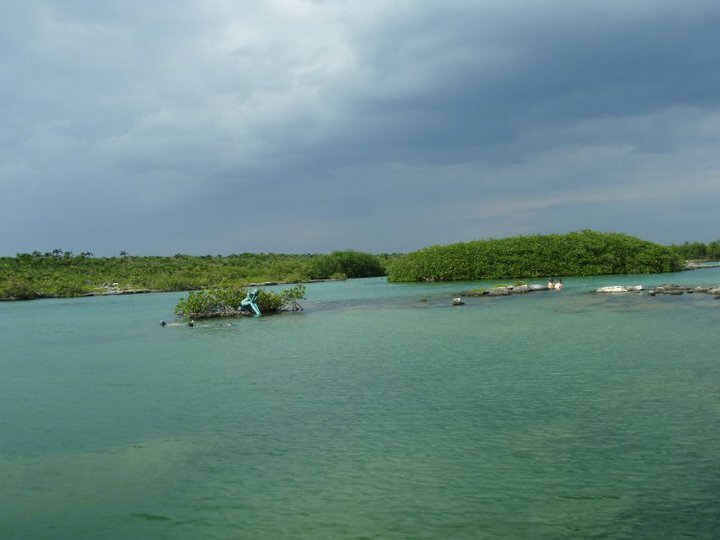 We drove on past the intersection that turns back to Tulum towards the Punta Laguna Monkey Reserve. We arrived just in time to catch the last tour which was highly recommended. Our guide was a young Mayan man (when I recall his name, I’ll update this page) who taught himself English and spoke it quite well. He said that a lot of people want to take the walk in the jungle alone and they are too noisy thus not able to see the howler monkeys. The guide was 25 USD for our group. Well worth it! We gingerly stepped and walked into the jungle and didn’t speak but in whispers and low voices. It wasn’t long before we came upon a family of howlers high up in the trees. It was quite amazing to see these creatures swinging in the treees above us. The best time to see them is in the early morning and also before dusk. Next time we’ll try the morning and spend more time. We wanted to see the lake before we left and what a perfect time to see it – at sunset.On the way heading home, the little Mayan children were still out and about, so I stopped to take a picture of them beautiful as they were. I handed them all a few pesos and receive a lot of smiles. What a great day of exploration in the Yucatan! Today we visited Xel-Ha, an ecological park for both kids and adults alike. We’ve never felt the desire to visit these places when traveling on our own, but with Sara as our travel companion we thought what better time to do this, plus we wanted to do something special with her. She was so excited because she was going to swim with the dolphins! It was tempting for us to do the same, but maybe next time. As soon as we entered the park we were impressed by the natural beauty of our surroundings and how well everything blended with the outstanding accomodations and ammenties. We put our things in lockers and lathered ourselves in sunscreen (biodegradable, of course!) and got Sara checked in for the dolphin adventure. We then went to a wonderful buffet breakfast – I usually “poo-poo” buffets, but this was wonderful! Now that our bellies were happy, we wandered on and found our way up the river, jumped on some inner tubes (which we later ditched) with our snorkel gear and meandered down the river into the lagoon. The combination of the waters meeting sometimes creates a murky feeling and is not always easy to see. Still we saw lots of fish and Sara actually saw her first turtle swim right next to her! Lucky girl! We stepped out of the lagoon and stopped by one of the many bars for a drink. Xe-Ha is all-inclusive so after you pay your admission your food and beverages, everything except the massage and the dolphin adventure are included in the 75 USD entry. (Tip – book online for a 10% discount.) We found a nice shady spot to watch Sara and her group in the natural pool of dolphins. It was just as much fun watching her get “foot pushed” into the air and through the water as if we were in the pool ourselves. I’m not sure where folks get the idea that these animals perform under pressure because even when they weren’t “on demand” it was clear by their frolicking nature that they were happy. Some we saw waiting their turn excitedly and impatiently as they could hardly wait! After the dolphin adventure we made our way to the wonderful dinner buffet and feasted on some great food and drinks! 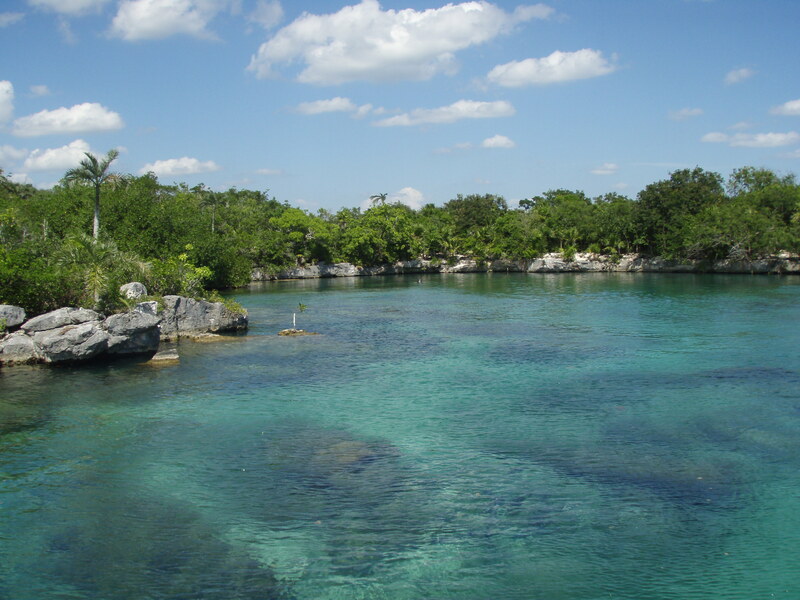 Again there wasn’t enough time to enjoy every aspect of the park but we will return to Xel-Ha again and again! 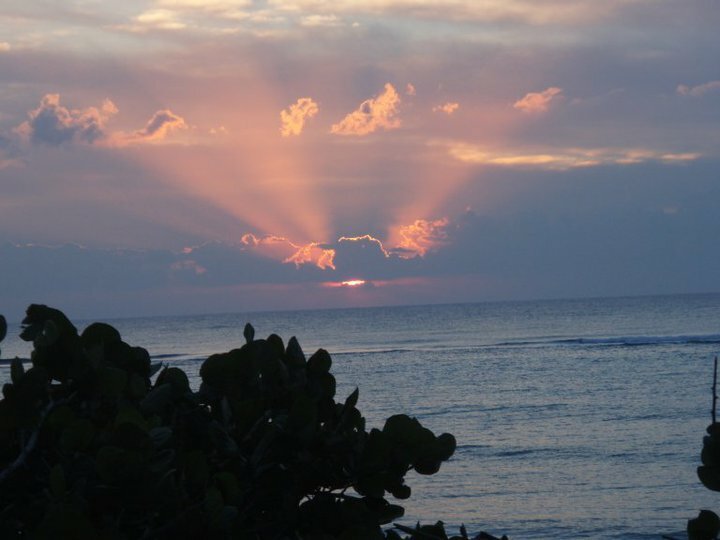 Another beautiful sunrise…….and then off for coffee and muffins at Turtle Bay Cafe in our little vacation “hometown” of Akumal. We did a little shopping afterwards while Mark walked back and picked up the car. Cute shops if you’ve forgotten your swimsuit or for casual evening wear. We all hopped in the car, made our daily stop at the market for more cold beer and then we drive down to the ancient ruins of Tulum. The best time to arrive at any of the ruins in early in the morning (which we did on our last trip to the ruins of the Yucatan) to beat the crowds of tourists that arrive in droves by bus. Also Sundays are family days in Mexico and there are a large number of local visitors. Since we were not in a rush at anytime on this trip we just went with the flow and the crowds. When we visited the ruins 3 years ago the grounds were in the process of being renovated and wow, what a nice job they did. The approach and entrance had changed and the path was immaculately landscaped. These ruins are not as spectacular in history and size as Chichen Itza or even Coba but the backdrop is incredibly by far the most beautiful. The are iguanas roaming the grounds everywhere you go and they seem completely comfortable with all of the visitors. We took lots of pictures of these inhabitants and of the scenic vistas overlooking the turquoise waters of the Caribbean. We took a lot of pictures for other tourists, too. That’s one of the fun things about being on vacation anywhere, all the people you meet from all over the world! After our visit at the ruins, we head into Tulum pueblo and have lunch at the highly recommended Don Cafetos – delicious food! With full bellies, we were then ready do the touristy shopping thing…….and taught Sara a little about bartering for gifts for her friends back home in Alaska. On the way home we drive down to the beach in Tulum where all the eco-resorts are lined up. The surf was rough but beautiful to see and the warm and glowing sunset showed us more proof of God’s magnificent handiwork!We relaxed with coffee to yet another beautiful sunrise over the Caribe. The weather today is different and you could see it in the clouds of the morning sunrise. A little bit windier so we decide to stay in Akumal and visit Yal-Ku Lagoon hoping that it’s calmer there. It is especially if you stay away from the mouth of the lagoon. Mark and I make the mistake of snorkeling out there against the current and saw nothing, so started to swim back into calmer waters. Aaaah, this is such a fun place to snorkel as there are so many coral formations and cave-like features to go in and out of, full of many different kinds of colorful fish. After snorkeling for a couple of hours, we actually got chilly. I have never been chilly in Mexico before. We get out of the water and dry off and decide to have the lunch of sandwiches and chips that we packed. We also had cold beers in the cooler too, but we weren’t quite ready for it. The inside of the car was so warm we decided to reacclimate our body temperature to it’s normal state. I think we sat in the car for close to an hour enjoying the sauna like state. Mark and Sara decided to go back in for more snorkeling as Jill and I took some video of them and walked around the grounds admiring the sculptures.This is a great little place to visit with a nice parking lot and places to sit, even a couple of picnic tables and a little “store” shack with a few ammenities you might need while you’re there.The admission is about $6 US per person. We woke up hungry and knew it was our last chance to eat at another “must try” on our list. So we walked north of the hotel a few blocks and towards the beach. We found La Cueva del Chango down a cobblestone street. It is such a groovy little place with great food! I had the best oatmeal, yes oatmeal, ever! We couldn’t wait to recreate it at the condo. It had cut up apples, papaya, yogurt, honey, chopped pecans and topped with a large grape cut and laid out as a flower. The fresh squeezed juice we had was so good! And the coffee, oh! The decor is kind of a chic, hippie with bottles embedded into the ceiling made of natural tree poles and some type of covering. The bathroom was even unique with a waterfall coming down for handwashing in a lovely stone basin. Definitely a return trip is in order here sometime too! We walked by an amazing Mexican tree of life on the way to the beach and walked through the sand back towards our hotel. Jill and Sara were amazed at the color of the water and were indeed happy to be here! When we returned to our rooms, we finished packing up and headed to Wal-Mart one last time before leaving this town for a few more things for the condo. We even had time for one last drive through the subdivision and the town of Chemuyil before checking into our condo on Half Moon Bay. Our visit through the town of Chemuyil was a lovely walk through the neighborhood. What a nice, clean community this was. We ate lunch at La Palapa and it was very good! We had ceviche, fish tacos and shrimp tacos and oh so delicious and helados which is ice cold beer with lime juice! Sara enjoyed her first horchata. I would definitely go back. The bano is a little….well, little. The people here are so nice too! We stopped at a couple of little produce stands to get more stuff for the condo and as long as we were here, one more drive through the subdivision. We arrive at the condo at 3pm to check-in and find a fabulous home with an incredible view of Half Moon Bay. This is where we hang our hats for a week! Heaven! Roberto, our host, was very gracious and a really cool guy. He was always on top of anything we needed. Back at the condo we arrive ready for slumber and a new day ahead tomorrow…..
Jill and I were the first to wake…..and lucky we were to enjoy the beautiful first sunrise of our stay on Half Moon Bay. We had brought fresh ground coffee from home as finding it in the stores is a little tricky, but I suppose now you could just go into Starbucks and buy some. For me, that sort of takes away from vacationing in Mexico when I end up in a corporate American company though. You can also find beans in several good restaurants like Cueva del Chango in Playa del Carmen and Turtle Bay Cafe in Akumal. So sipping our fresh brewed beans and watching the turtles bobbing up and down was a great start to another day in paradise. By the time we donned our gear, the turtles had swam away. Still the snorkeling in the bay is amazing and we enjoyed a relaxing morning flapping around with the fish in the Caribbean Sea. We spent this day just cruising around the condo and surrounds of Akumal, visiting the little store for a couple rounds of cold beer. We did a lot reading, relaxing and good conversation. Leftovers and some good tequila topped off our 2nd evening on the balcony of our condo as we watched the day fade away from the horizon. We enjoyed some unusual entertainment from Mother Nature as baby geckos, crickets and ligtening bugs danced all over the floor. Even a swarm of bees infilitrated us which was a little scary. That didn’t stop us though – we burned a coil that sort of stunned them and Jill promptly smacked approximately 18 bees with a magazine. There never seems to be enough time during the daily grind for just chillin’ so this was a time to recognize this and just be grateful for this simply beautiful day. Upon picking up Jill and Sara at the airport (their plane was about an hour late getting in), we headed back to the hotel so that the girls could get settled in. They needed to do some shopping for beachwear and what better way than to start out their trip to the Roo with a walk down Quinta Avenida? After more than a few shops in, we decided to eat at Yaxche – it is one of our favorite places to eat. A little spendy but a very nice atmosphere and great food. It was quiet that evening, perfect for Jill and Sara’s arrival after such a difficult time in their lives. After dinner we continued on down 5th and were finally successful in finding a bathing suit for Jill and flip flops for Sara. They were ready for the beach now and we were ready for a cold beer, so we stopped in at La B del M where they had some nice tropical sounds playing. When the band took a break, we head some other live music playing just a few doors down. I’d never given this little mall at the end of the avenue much thought but it proved to be a nice beverage stop twice so far. We were tired and headed back to the Fiesta Banana so that we could kick back and relax. Mark headed off to bed with a book and we girls sat out on the patio balcony and surfed the internet and listened to the never-ending techno beats coming from next door. Still it was good to wind down and reconnect in a new environment and look forward to this healing time without Steve on this trip and in our lives. I can only imagine how daunting this was for Jill. She needed this time to decompress from all of the difficult duties that awaited her at home and seek a new perspective to this tragedy. Next morning we are up early and on the road again. We were excited to get Jill and Sara out and about showing them everything we’d experienced before and in the coming days new things we’d all experience together. We spent the first part of the morning shopping in Playa del Carmen before heading out to Akumal Bay….and of all places, at both Sam’s Club and Walmart. Aye, aye, aye…..I must say it worked out well though. I have never seen such an amazing selection of good yogurt! I will miss that at home. After stocking up on beer, lunchmeats, bread, chips for our lunch…..oh, and don’t forget the ice for it is a beautiful hot day. After a drive through the subdivision again (do you see a pattern beginning?) we head over to Akumal Bay and stake out a nice shady spot under a palm on the beach. We enjoyed our picnic lunch and showed Jill and Sara how to snorkel. Just as I’d hoped and secretly knew, they were hooked. It was so much fun to get out there again, even though the water was a bit rough for snorkeling if you stayed in close you enjoyed some nice large schools and some colorful little guys here and there. This made us really look forward to moving into the condo at Half Moon Bay. Just one more day and we’re there! Back to the hotel after a fun and busy day and a good night’s sleep before we check out in the morning. Today is a long awaited first day of our vacation – our return to the Caribbean coast of Mexico. Since our journey here 3 years ago, we’ve changed our realm of thinking how the world is. Our horizons have been broadened and our minds opened to new and exciting possibilities. That was our 25th anniversary trip in 2004 and it was wonderful. Now we celebrate again 3 years later our 28th anniversary. This trip will be different as all trips are and yet it too will bring new feelings and thoughts on the world and life as we live it. We were supposed to take this trip with both Jill and Steve, but the tragedy that was so very unexpected changed those plans…..and more importantly it changed Jill and Sara’s lives forever. Steve’s death, was not in the plans…….not even for Steve. I am glad that the girls have decided to join us anyway and I hope that we will be able to give them some joy and help them to feel this healing environment in their hearts and begin to make happy memories in their new life. They will be with us in two days. After a easy and relaxing morning at the airport and a nice flight we are about to land in Cancun, where Continental Car Rental will pick us up and take us to our car rental. We are so excited to get on the road and head to Playa del Carmen and the Hotel Fiesta Banana. Before our plane landed, we were surprised to see our neighbors Lance and Annette Lane were on our plane with a group of friends headed for Cancun. They were surprised to see us as well. We spent many mornings and afternoons together on the baseball field with our boys over the years so it was nice to run into them and of all places at 35,000 feet in Mexican airspace. We’ll have to touch base with them later to see how they enjoyed their trip to the Riviera Maya. Claiming our luggage, going through immigration and customs went smoothly and fairly quick. The car rental representative was there with a sign that said “Brown”. Wow, did we feel special. We took a short and very Mexican drive to the office, picked up our car and were on our way down Highway 307 towards Playa del Carmen. We found our hotel fairly easy as we remembered the neighborhood, Little Italy, from our last trip. We checked into the Fiesta Banana for the next 4 nights. It was a clean and hip little boutique type hotel of the almost 3 star nature but would suffice for all we needed it for was sleeping and changing our clothes. It was in the right part of town after all – easy parking, coffee shop below with internet and just a few blocks walk to Mamitas Beach Club. It’s location is at the quiet end of the famous Quinta Avenida where all the restaurants and shops are that the tourists love to frequent. We began our walk down 5th and felt elated to be back in this place after a 3 year absence. Our mission on this night was to take a long awaited look at the lovely Caribe and dip my feet into it’s warm waters…..and find good mojitos. After dining at Tango Taco, which was not as good as the first time we were here we continued on our walk down the Ave for our evening drinks. Our first stop was La Bodeguita del Medio where we sipped on delicious mojitos and met a wonderful couple we visited with from Argentina via Florida. After a while we meandered happily the opposite direction back towards our hotel and stopped in at Bourbon Street to try their recipe for mojitos. These were also quite good. When we arrived back to our room, we were feeling completely relaxed and ready for dreamland in paradise. Of course waking up and knowing you are in paradise is one of the best feelings one can have, even if your night of sleep on the hard Mexican beds wasn’t the best. 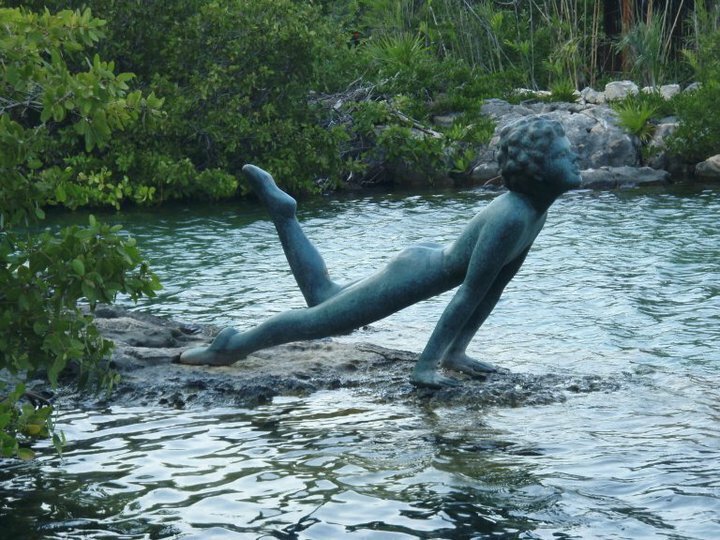 We were on a new adventure in the Yucatan and had a flexible yet full itinerary. Our first order of business for the day was to trade the rental car for the one we’d reserved. American (Continental) Car Rental promised to send a representative from the office in Cancun to our hotel at 9am sharp so that we could start our day and get on the road. We’d planned to go and visit Xcacel Beach and the housing subdivision in Chemuyil. After about 20 minutes of patiently waiting we decided to go to the local office only to find out that they did not speak a lick of English. I think they understood more than they spoke though and we didn’t feel comfortable with the communication. We just didn’t want to end up with any snafus over the rental car bill. We left and decided we’d just drive up to Cancun and take care of our business there. Unfortunately a curb jumped out at us (it did!) and we ended up with a very flat tire. We rolled into the Pemex and hurriedly a crew of about 5 young Mexican men came to our rescue. We were so frustrated by this point as our morning was not going the way it was supposed to be….but we knew that we’d eventually get where we were headed….and after all we were where we wanted to be. Even with the language barrier Mark and the guys were able to joke around about how to change a tire over the course of about 20 minutes. We filled the tank up with petro and were about to be on our way! Suddenly there was a man running up to our car who appeared to be from the rental car agency. I rolled the window down and he said “Mr. Brown, Mr. Brown we are very sorry for the confusion this morning. Please accept our apologies and you may keep this car and no extra charges will be made.” Pshew! What a relief – at least we wouldn’t have to jump through more hoops after an already tiring morning! We started to drive down Highway 307 towards Chemuyil and decided that all of that commotion called for some shrimp tacos and beer! After all it was nearly noon. La Floresta was one of the restaurants on our suggested list so we pulled in and enjoyed a much needed reprieve and regrouping. The shrimp tacos here were quite good and the beer was nice and cold. We were ready for our afternoon. Mark had found the Chemuyil subdivision on a website a fews weeks prior to our leaving town. He was excited at the prospect of being able to buy a vacation/retirement casa so close to one of the most beautiful beaches in Mexico and wanted to see these homes first thing! We found the town of Chemuyil and then the turnoff to the subdivision. It was a very quiet neighborhood with most of the homes still vacant since this “new” project was recently opened up to foreigners. Afterwards we crossed the highway and went to Xcacel Beach. This is a turtle protected beach and there’s actually a small palapa shack with a “guard” on duty. You pay him a few pesos to pull in and park and have a beautiful, quiet beach all to yourself. If he’s not there, come antother day. We only saw a few other people there the whole time – one of them was an ecologico worker and was counting nests. They say not to visit the area from May through November as you will disturb the nests. I love this beach! There’s a shell there that seems to have made its home there and I hope it is there when I visit again. What a nice ending to a day that started out a bit rough. We ate dinner at Babe’s Noodle Bar, their 2nd location, which was right on 5th just a couple of blocks from our hotel. We’d eaten at the original location right in the heart of Playa on 5th when we were here before. The food is an Asian fusion of flavors and outstanding. Their mojitos were the bomb! Better than the others we’d tried. Another “must visit again” for our list…….and another night of peaceful sleep in paradise. The next morning slept in until about 8am, woke up and went for coffee just down the street (no Starbuck’s for us) at a local shop. Afterwards we threw our suits on and went to Mamitas Beach Club where we claimed a spot under a palapa on some comfy lounge chairs. After soaking up just a few rays, we promptly threw ourselves into that beautiful boyount, soft and sandy beach. We thoroughly enjoyed sipping a fresh squeezed orange juice and relaxing – being here again. Swimming worked up our appetite and we ordered an early lunch, lazed in the sun and swam some more. Every so often we felt a little sprinkle. It was getting a bit past noon and we decided to head back to the hotel for a shower so we could get ready to go and pick up Jill and Sara at the airport. A cloud burst above us on our walk back and we got drenched! We actually had to take cover in front of a pizza bar for a few minutes and then fnished our way home.